Whale Tail motif on blue back ground. Standard size 6.5 by 9.5 inches. Signed by artist Bob Lercari. Abstract ocean cheese plate. Standard size 6.5 by 9.5 inches. Signed by artist Sandra Lercari. 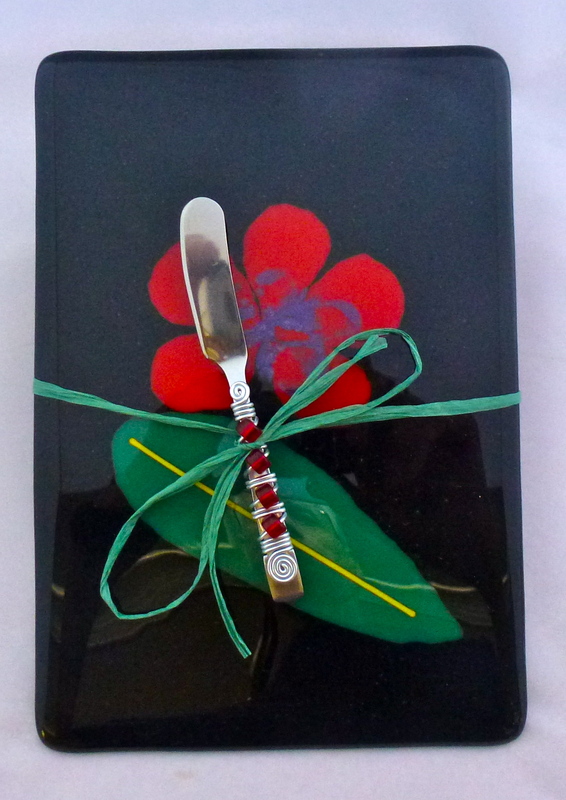 Red plumeria on black cheese plate. Standard size 6.5 by 9.5 inches. Signed by artist Sandra Lercari. Also available with flowers in other colors as well as other back ground colors ( cream and spring green). Specify using "Contact Us". 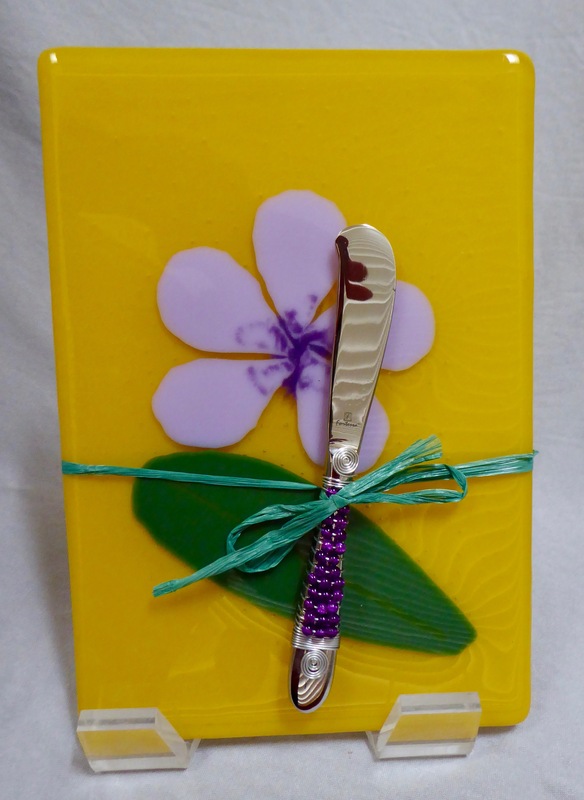 Violet plumeria on white cheese plate. Standard size 6.5 by 9.5 inches. Signed by artist Sandra Lercari. Also available with flowers in other colors as well as other back ground colors ( cream and spring green). Specify using "Contact Us". 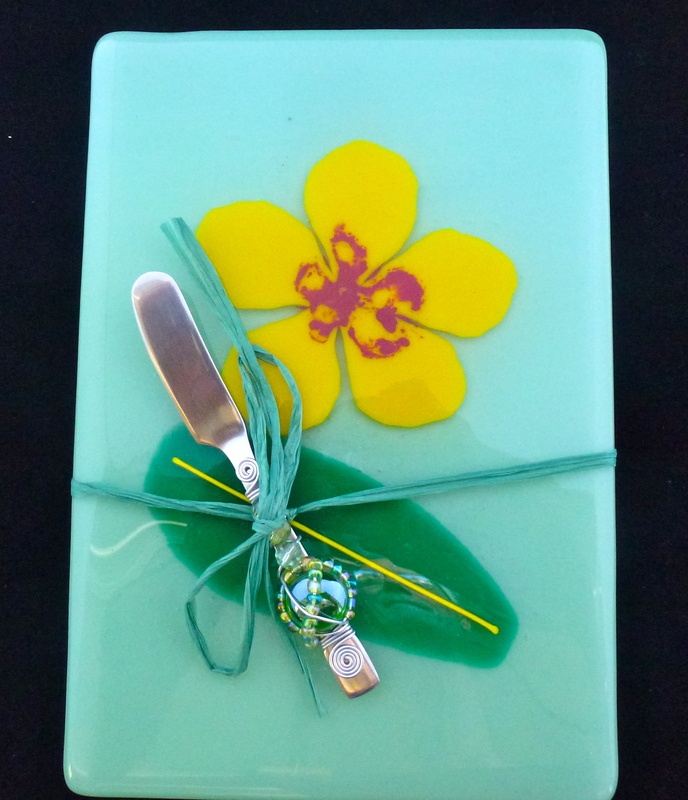 Plumeria motif on spring green back ground. Standard size 6.5 by 9.5 inches. Signed by artist Sandra Lercari. Also available with flowers in other colors as well as other back ground colors ( white, cream, marigold yellow, forest green, teal, neolavender, and black). Specify using "Contact Us". Plumeria motif on black back ground. Standard size 6.5 by 9.5 inches. Signed by artist Sandra Lercari. Also available with flowers in other colors as well as other back ground colors ( white, cream, marigold yellow, forest green, teal, neolavender, and spring green). Specify using "Contact Us". 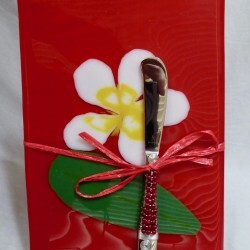 Plumeria motif on white back ground. Standard size 6.5 by 9.5 inches. Signed by artist Sandra Lercari. Also available with flowers in other colors as well as other back ground colors ( spring green, cream, forest green, teal, neolavender, and black). Specify using "Contact Us". Plumeria motif on mint green back ground. Standard size 6.5 by 9.5 inches. Signed by artist Sandra Lercari. Also available with flowers in other colors as well as other back ground colors ( white, cream, spring green, forest green, teal, neolavender, and black). Specify using "Contact Us". 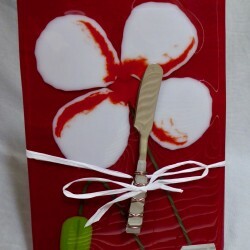 Plumeria motif on Tomato Red back ground. Standard size 6.5 by 9.5 inches. Signed by artist Sandra Lercari. Also available with flowers in other colors as well as other back ground colors ( white, cream, marigold yellow, forest green, teal, neolavender, and black). Specify using "Contact Us". Honu (Hawaiian for sea turtle) on cyan blue. Standard size 6.5 by 9.5 inches. Signed by artist Bob Lercari. Also available in other back ground colors ( turquoise, cobalt blue, and Egyptian blue). Specify using "Contact Us". Abstract motif. Standard size 6.5 by 9.5 inches. Signed by artist Sandra Lercari. 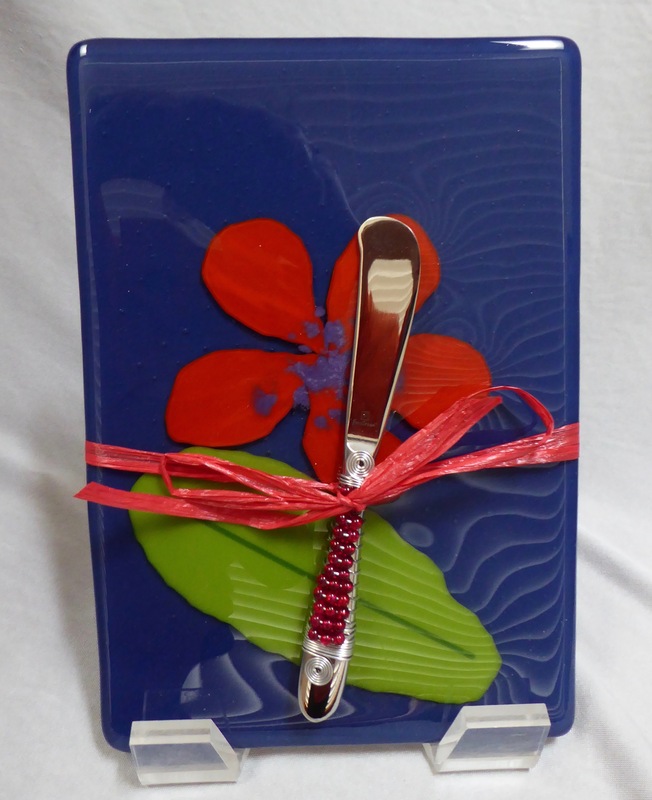 Plumeria motif on deep cobalt blue back ground. Standard size 6.5 by 9.5 inches. Signed by artist Sandra Lercari. Also available with flowers in other colors as well as other back ground colors ( white, cream, marigold yellow, forest green, teal, neolavender, and black). Specify using "Contact Us". 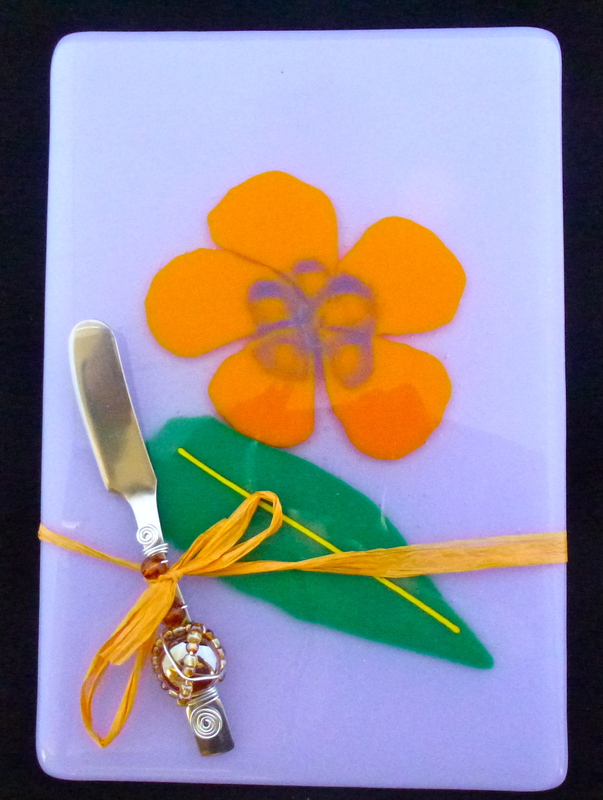 Plumeria motif on marigold back ground. Standard size 6.5 by 9.5 inches. Signed by artist Sandra Lercari. Also available with flowers in other colors as well as other back ground colors ( white, cream, cobalt blue, forest green, teal, neolavender, and black). Specify using "Contact Us". 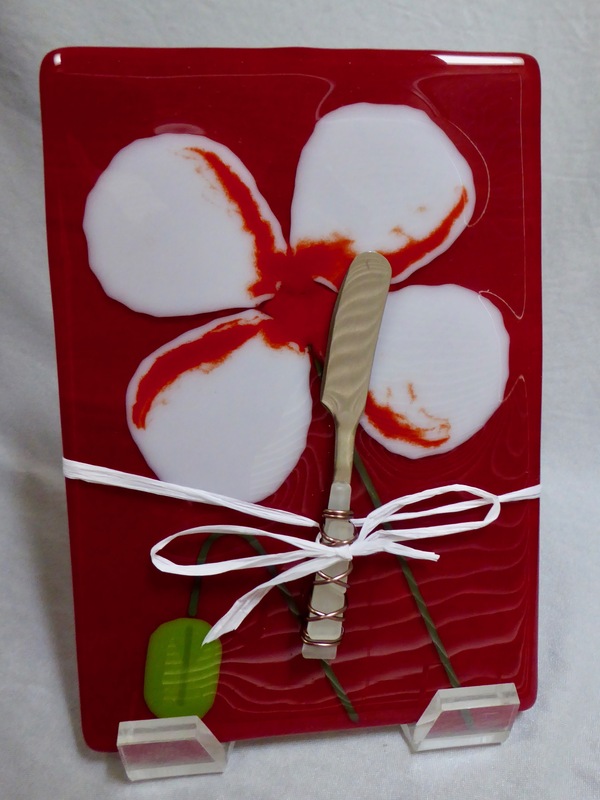 Red Anthurium motif on white back ground. Standard size 6.5 by 9.5 inches. Signed by artist Sandra Lercari. Also available with other back ground colors (cream, neolavender, and black). Specify using "Contact Us". The Pupu Dishes are 4" by 13". 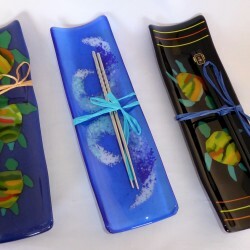 They come with chop sticks and are currently in two motifs...Waves by artist Sandy Lercari and Honu by Bob Lercari. 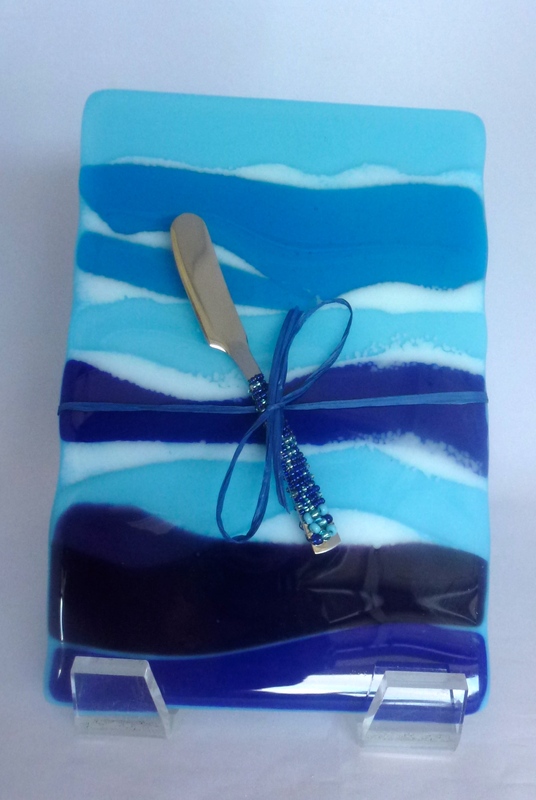 Various blues in transparent or opaque, as well as black opaque are available as background. 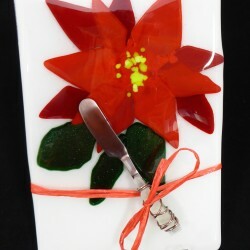 This 6.5 by 9.5 inch cheese plate is made with hand cut glass and frit (glass chips) fused on top of 2 layers of glass. 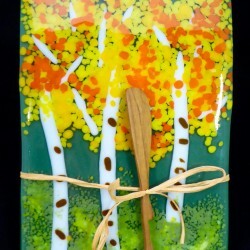 The Aspen in Fall design is created and signed by artist Bob Lercari. 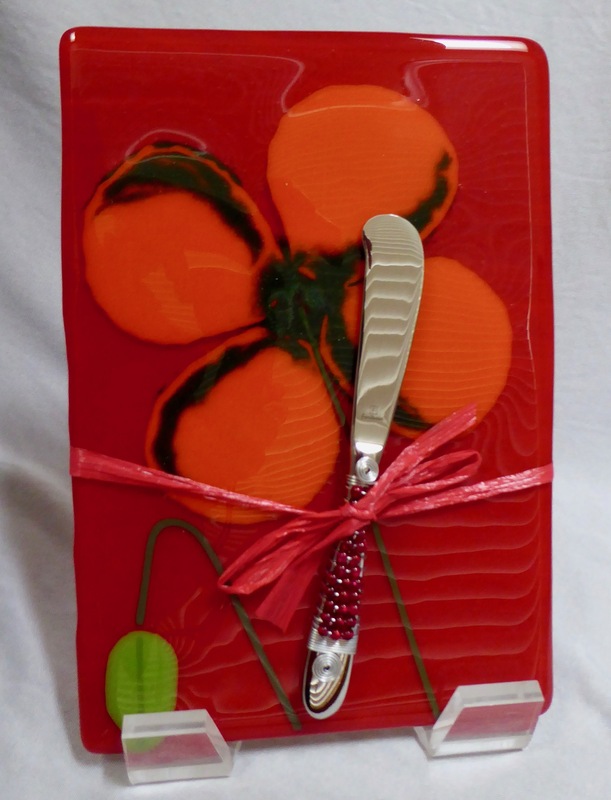 A carved wooden knife is provided. 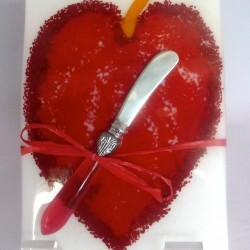 This 6.5 by 9.5 inch cheese plate is made with hand cut glass and frit (glass chips) fused on top of 2 layers of glass. 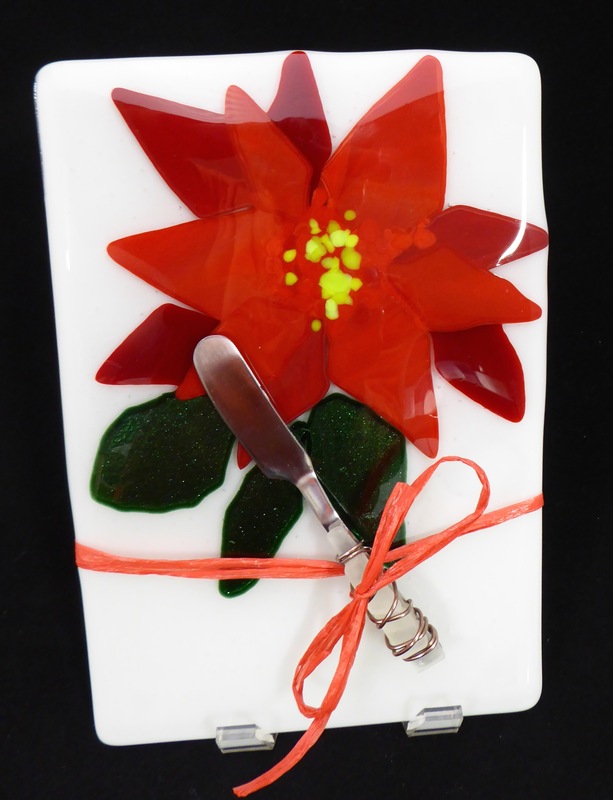 The Poinsettia design is created and signed by artist Bob Lercari. A knife is provided. 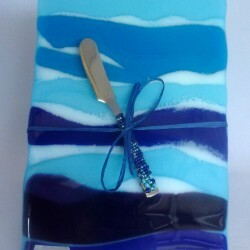 This 6.5 by 9.5 inch cheese plate is made with hand cut glass and frit (glass chips) fused on top of 2 layers of glass. 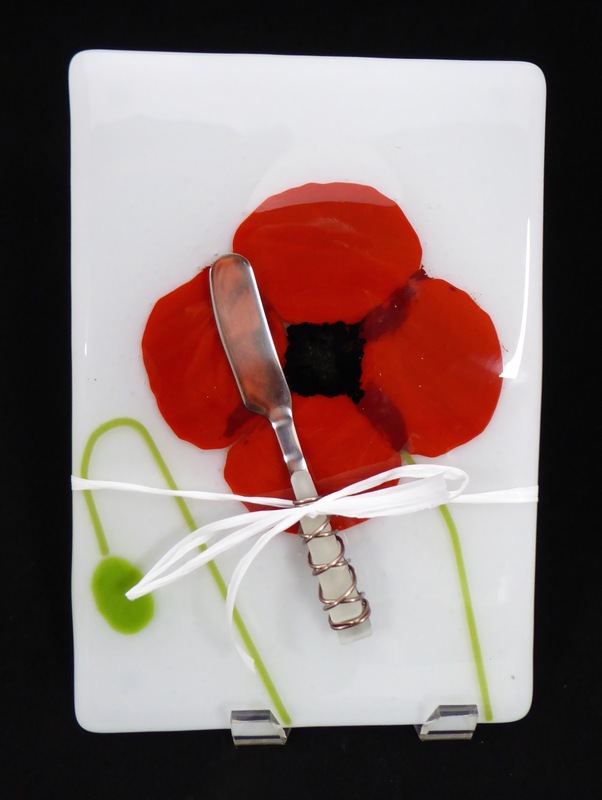 The Poppy design is created and signed by artist Sandy Lercari. Poppies of various colors on backgrounds of various colors are also available. A knife is provided. 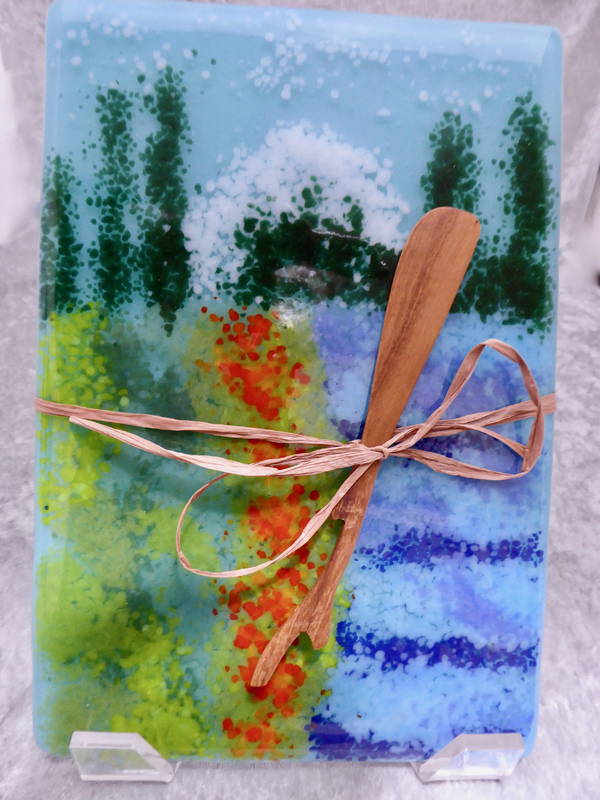 This 6.5 by 9.5 inch cheese plate is made with frit (glass chips) fused on top of 2 layers of glass. 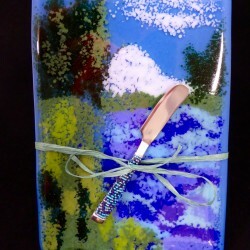 The Oregon landscape design is created and signed by artist Sandy Lercari. A knife is provided. 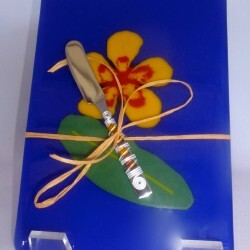 Plumeria motif on cobalt blue back ground. Standard size 6.5 by 9.5 inches. Signed by artist Sandra Lercari. Also available with flowers in other colors as well as other back ground colors ( cream, marigold yellow, greens, neolavender, and black). Specify using "Contact Us". 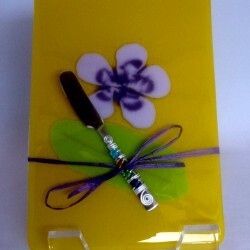 Lavender Plumeria motif on sunflower yellow back ground. Standard size 6.5 by 9.5 inches. Signed by artist Sandra Lercari. Also available with flowers in other colors as well as other back ground colors ( cream, marigold yellow, greens, neolavender, reds, blues, and black). Specify using "Contact Us". 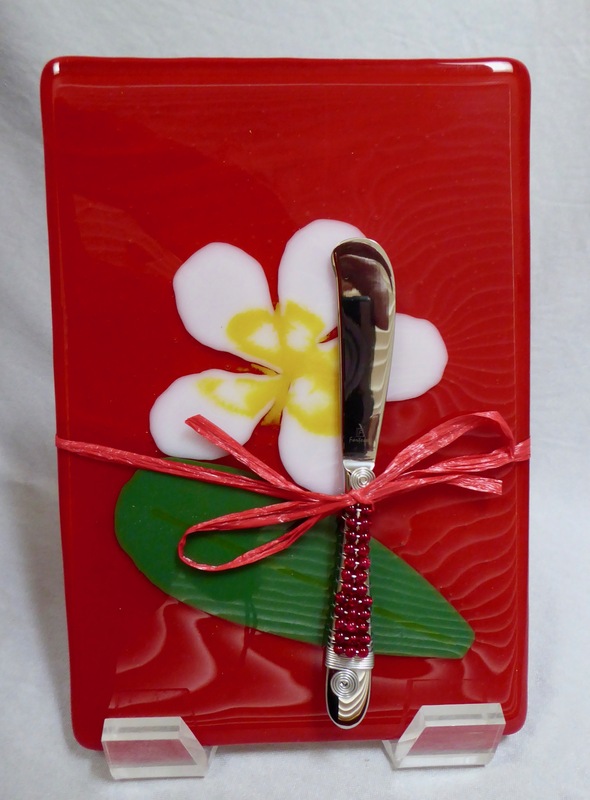 White Plumeria motif on red back ground. Standard size 6.5 by 9.5 inches. Signed by artist Sandra Lercari. Also available with flowers in other colors as well as other back ground colors ( cream, marigold yellow, greens, neolavender, blues, and black). Specify using "Contact Us". 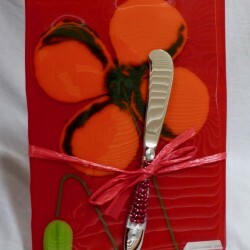 Orange poppy motif on red back ground. Standard size 6.5 by 9.5 inches. Signed by artist Bob Lercari. Also available with flowers in other colors as well as other back ground colors ( cream, marigold yellow, greens, reds, and blues). Specify using "Contact Us". 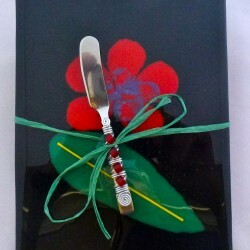 White poppy motif on deep red back ground. Standard size 6.5 by 9.5 inches. Signed by artist Bob Lercari. Also available with flowers in other colors as well as other back ground colors ( cream, marigold yellow, greens, reds, and blues). Specify using "Contact Us". 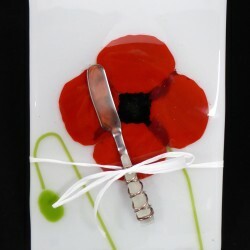 Red poppy motif on white back ground. Standard size 6.5 by 9.5 inches. Signed by artist Bob Lercari. Also available with flowers in other colors as well as other back ground colors ( cream, marigold yellow, greens, reds, and blues). Specify using "Contact Us". Central Oregon cheese plate. Standard size 6.5 by 9.5 inches. Signed by artist Sandy Lercari. This drop pot was created using several greens and some orange. It is 12 inches in diameter. This is a signed one of a kind piece by artist Sandra Lercari. Orange and yellow pattern bar on tomato red. 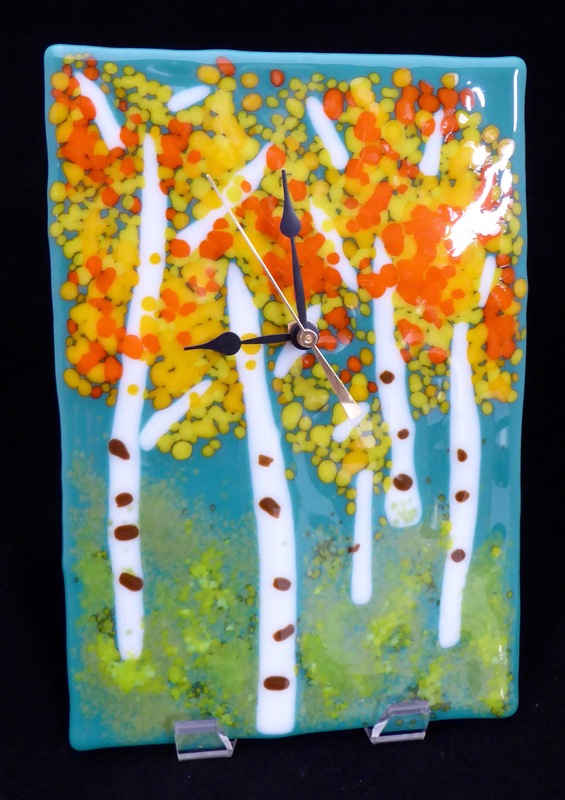 This is a unique one of a kind 9 by 9 inch quartz clock created and signed by artist Sandra Lercari. Nine inch clock with whale tail motif created by Bob Lercari. Geometric purse clock with squares in brown and green. Created by artist Sandy Lercari. 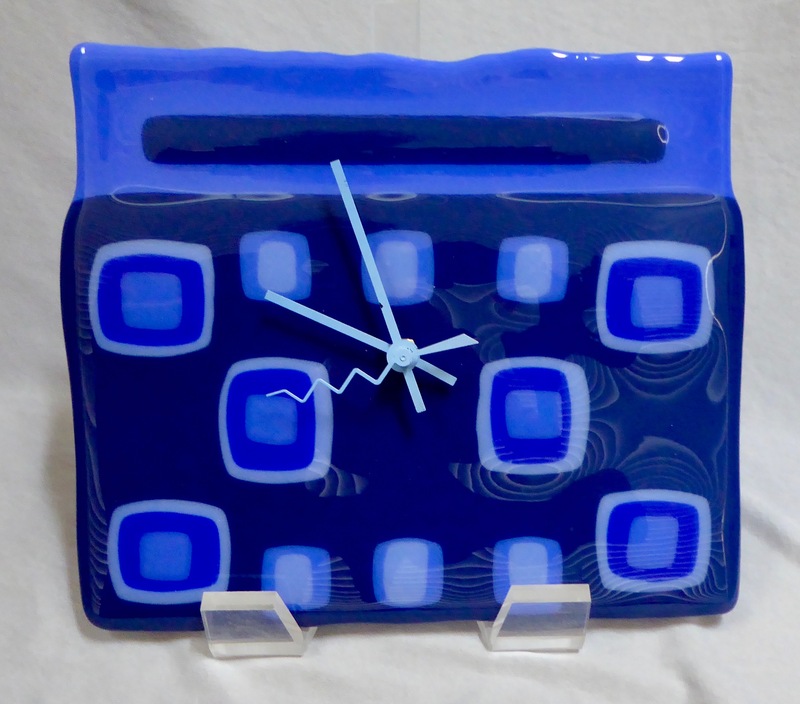 Nine by nine inch retro clock with squares and rectangles in violets and blue created by Sandy Lercari. Nine inch clock with wavel motif created by Sandy Lercari. Nine by nine inch clock with abstract evening sky stripes created by Sandy Lercari. 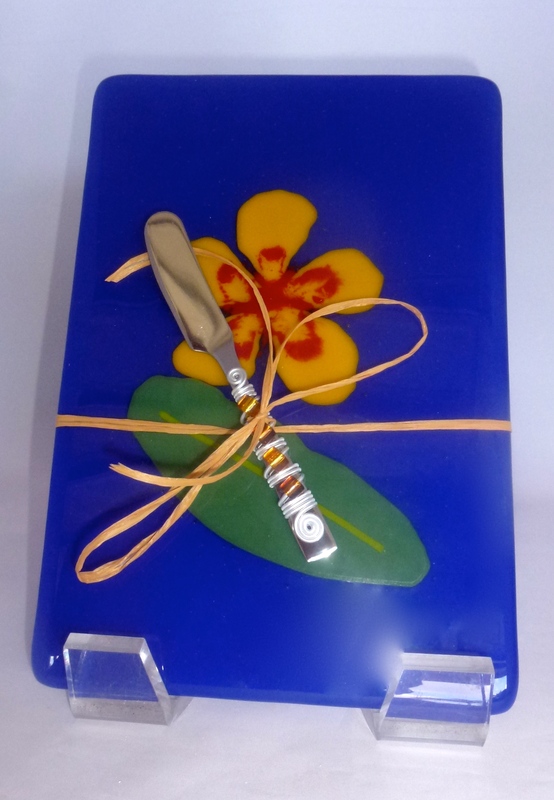 Nine by nine inch clock with a marigold plumeria flower on three blue stripes created by Sandy Lercari. 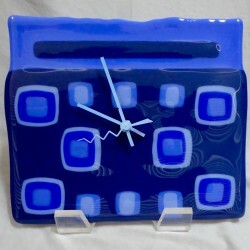 Nine inch wave motif clock on periwinkle blue base created by artist Sandy Lercari. Plumeria motif on forest green back ground. Standard size 8 by 10 inches, Quartz movement run by one AA battery. Signed by artist Sandra Lercari. Also available with flowers in other colors as well as other back ground colors ( white, cream, marigold yellow, spring green, teal, neolavender, and black). Specify using "Contact Us". 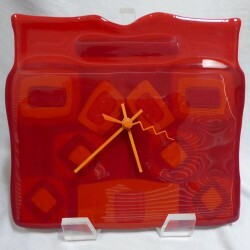 The red purse clock is a one of a kind piece created by Sandra Lercari. 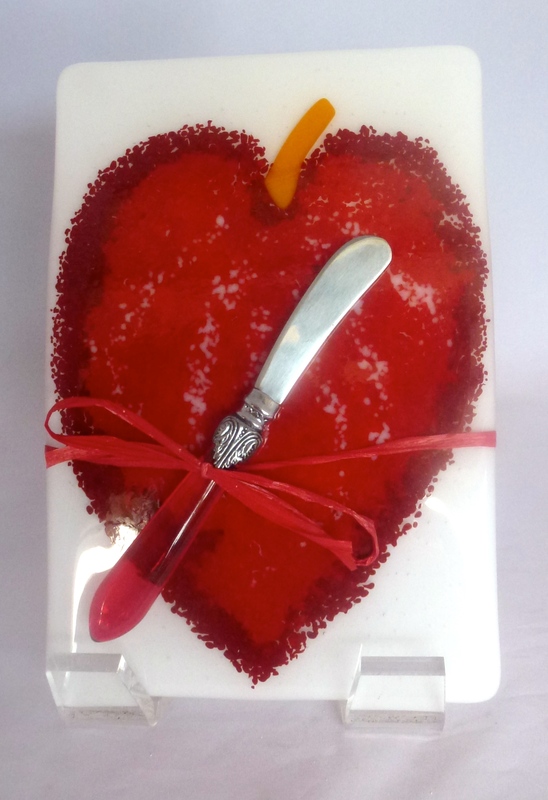 It was created using square and rectangular pieces of opaque glass in reds and orange. The approximate dimensions are 8 by 8 inches. 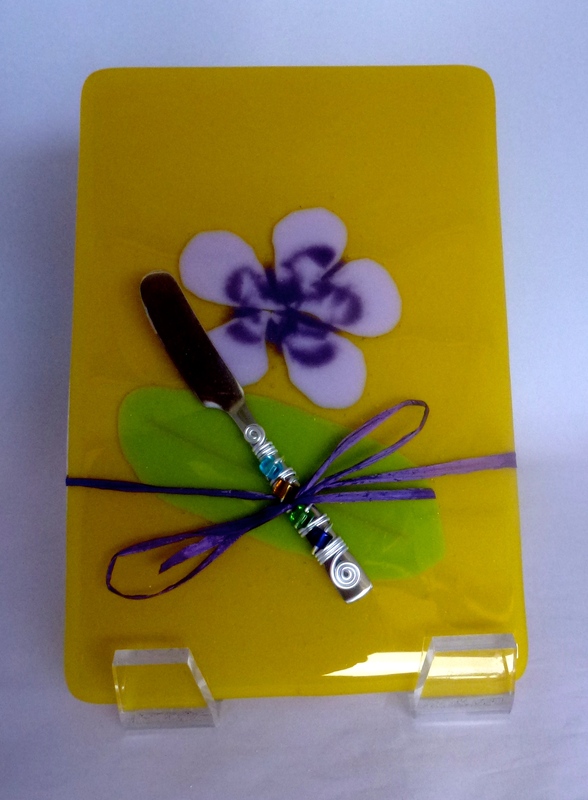 The black and purple purse clock is a one of a kind piece created by Sandra Lercari. 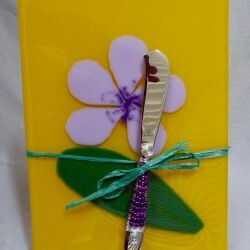 It was created using square and rectangular pieces of opaque glass in purples. The approximate dimensions are 8 by 10 inches. 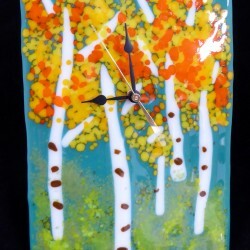 The green purse clock is a one of a kind piece created by Sandra Lercari. 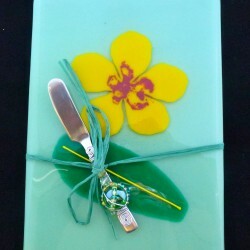 It was created using square and rectangular pieces of opaque glass in green and yellow. The approximate dimensions are 8 by 10 inches. 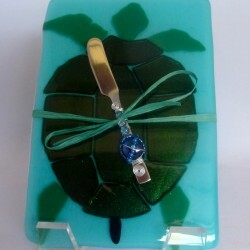 This 6.5 by 9.5 inch clock is made with hand cut glass and frit (glass chips) fused on top of a single layer of glass. 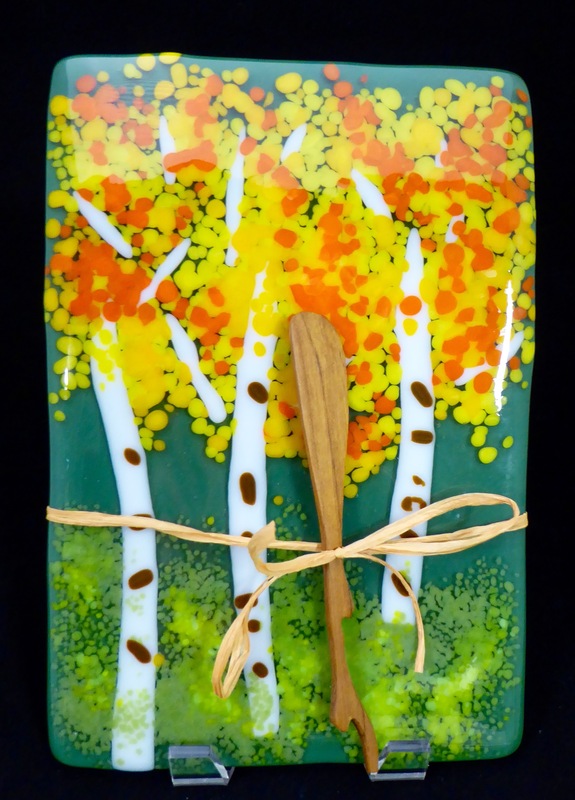 The Aspen in Fall design is created and signed by artist Bob Lercari. This 15 inch drop pot clock is made with yellows and orange glass. 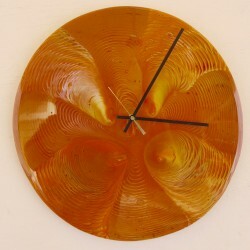 Similar drop pot clocks have been created in other basis colors, including greens, blues, reds, as well as tortoise shell. Each is organic in design and is a one of a kind signed piece by artist Bob Lercari or Sandra Lercari. These large clocks have metal backing for hanging. 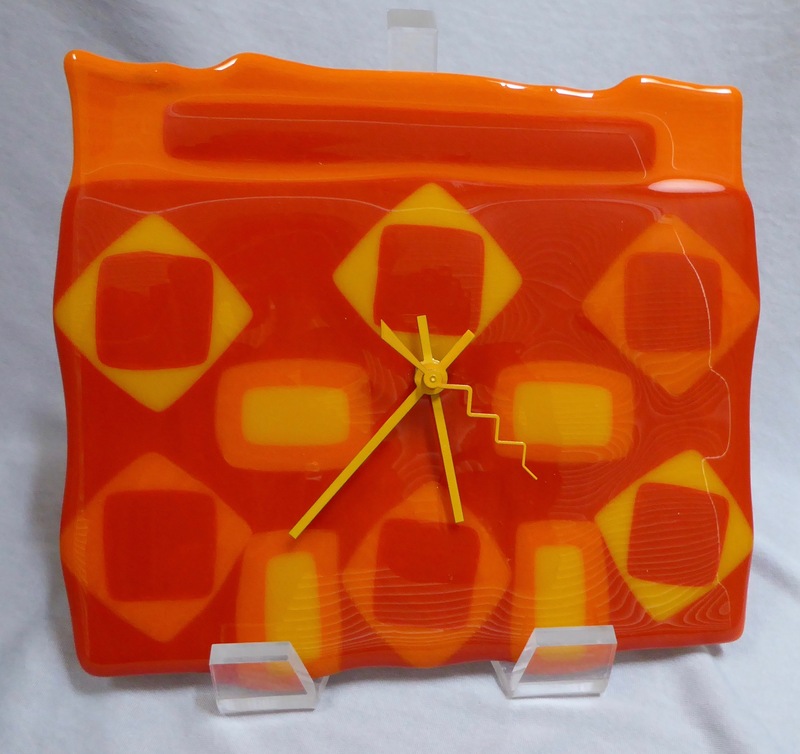 The orange purse clock is a one of a kind piece created by Sandra Lercari. 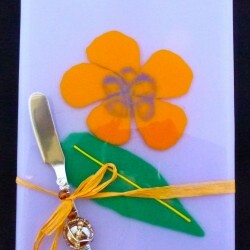 It was created using square and rectangular pieces of opaque glass in oranges and marigold yellow. The approximate dimensions are 8 by 10 inches. 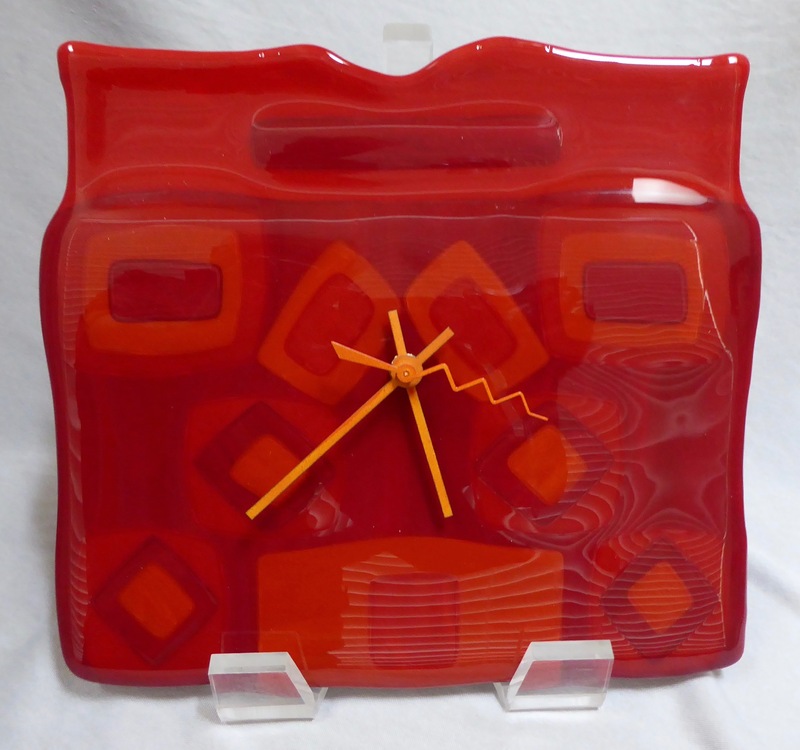 The red purse clock is a one of a kind piece created by Sandra Lercari. 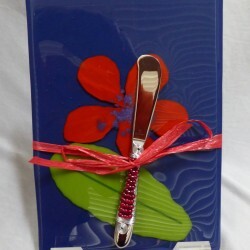 It was created using square and rectangular pieces of opaque glass in shades of red. The approximate dimensions are 8 by 10 inches. 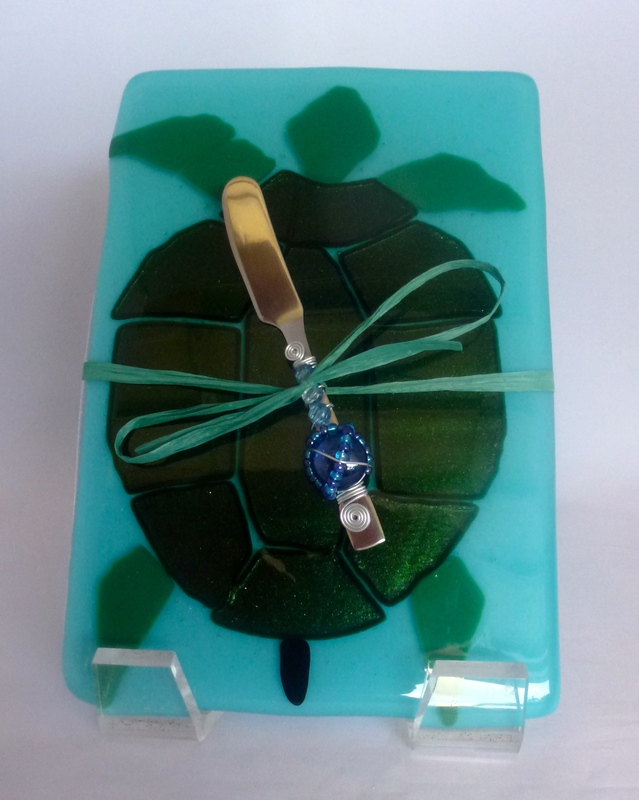 The blue purse clock is a one of a kind piece created by Sandra Lercari. 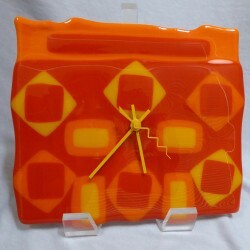 It was created using square and rectangular pieces of opaque glass in oranges and marigold yellow. The approximate dimensions are 8 by 10 inches. 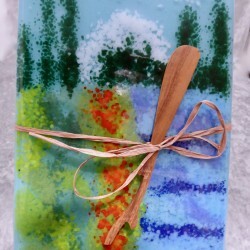 Two popular functional glass art items are our cheese plates and wine stoppers. Our standard a cheese plate is 6.5 by 9.5 inch rectangle. They are done in the Mosaic design approach and include sea inspired, floral inspired, as well as purely abstract designs. A spreader is provided with the cheese plate. The retail price for the standard cheese plate is $80. However, these are currently being offered at $50. Clocks are basically “wall hangings” with function. The movement is a AA battery-run quartz. Shapes are circular, rectangular, or square and are generally about 9 inches in size. Depending on the design, retail price ranges from $110 to $135. However, these are currently being offered at wholesale prices. There are also some limited Drop Pot pieces that are about 12 inches in diameter and retail at $200-250 with 15 inch Drop Pot clocks in the $300 to $350 range. However, these are currently being offered at wholesale and below prices.